Almost all our customers find ANDES trips better than those run by the bigger expedition companies. Many of our clients return year after year. Have a look at our latest Customer Satisfaction page for further details. On this page we have tried to sum up what makes our trips different to those offered by the larger adventure holiday companies. But please note that what we write about here are just some examples. 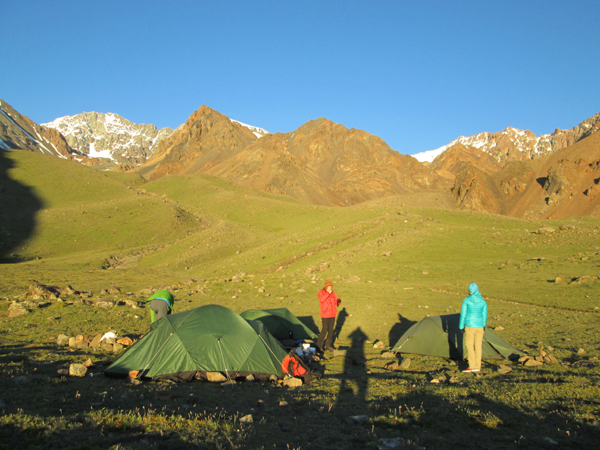 What you get on your own expedition may be different because at ANDES we believe in the concept of genuine adventure. You can't package an adventure, so come to the Andes with an open mind and just enjoy yourself. We take much smaller groups, and use low guide:client ratios, so there is usually room for some flexibility in itineraries and there is always more day to day flexibility when climbing, skiing or trekking. We also use fewer intrusive services in the mountains - there is unlikely to be a large mess tent, two cook tents and ten or more staff waiting for you when you get back from a remote summit. You may find yourself eating your supper while sitting out with a group of four or five others under the fantastic southern hemisphere stars. Of course we do use horses/donkeys and porters for quicker and easier access to the mountains, but even these expeditions are kept 'lightweight' in style and you won't be walking alongside a huge supporting column of porters or pack animals day after day. Sunrise at our campsite, Cordon del Plata, January 2016. We lead where other companies follow . Many of ANDES trips are pioneering, making first ascents or going into areas of the Andes where other guided and 'commercial' groups don't go - at least not yet. See our Firsts page for further details of some of our pioneering expeditions we've led over the past 20 years. Eight years after we first pioneered a ski-mountaineering trip to Chile in 1999 - Jagged Globe finally put one on their schedule in 2007 - by that time ANDES had already run eight different ski trips to Chile and Argentina. We first went to Colombia in 1999 and in December 2015 ran our seventh successful trip to this great country, climbing Pico Colon, the highest peak in the country, which had been without a confirmed ascent for over 20 years. Jagged Globe were again about ten years off the pace as they finally launched a Colombia trip for Christmas 2011. We have been running commercial Ojos del Salado expeditions since 1996, and have reached the summit with clients now on 6 separate occasions. In contrast Adventure Peaks finally added this mountain to their schedule in 2014. We like to involve clients more in the day to day running of the trip. On a recent "First Ascents in Peru" trip several clients accompanied the leader on a reconnaissance trip and helped choose and check out the route. One client recently wanted to spend some time cleaning a stove that had been blocked by bad fuel and was really pleased to get it working again. The majority of people find this involved approach much more satisfying and fulfilling than just sitting around waiting for things to happen. But please note that if you're tired or ill or even just can't be bothered, your expedition leader will look after you. We don't run trips this way to make our leaders job easier, but to give you a more satisfying experience. 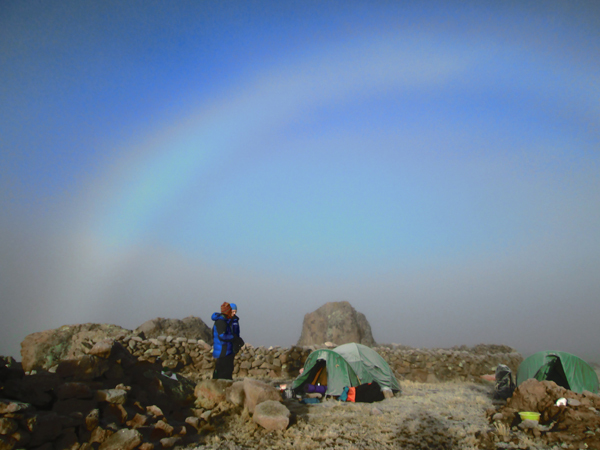 Fog bow at camp in the Cordillera Huanzo, Peru, June 2015.